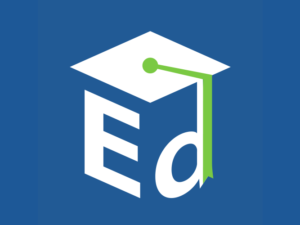 “Lots of students don’t have college resources available to them. So, if I can be that resource for them, that just makes my day. Mentorship is important to Trisha-Joy Jackson. Jackson has been serving as the Wake College Center Coordinator during the 2016-2017 school year. 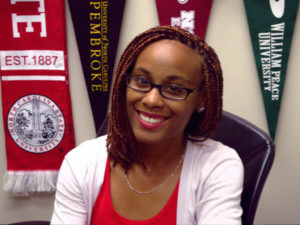 She supports Wake County middle and high school students throughout the college application process. Jackson attributes her success to mentors who supported her during her high school and college years. Jackson attended public school from kindergarten until 8th grade. Through the support of the Wight Foundation based in Newark, New Jersey, Jackson attended a boarding school in Newport, Rhode Island during her high school years. It was challenging at first living four hours away from her home, but her mom encouraged her to stick with it. She connected with people on her campus who supported her. Looking back on the experience, she described how she greatly enjoyed living on the beach and having new opportunities, like managing a girls varsity hockey team. The boarding school Jackson attended also helped a lot with college preparation. Mentorship played an important role for Jackson during college as well. As a college senior, she joined an African-American women’s group. The group helped her during her final year in college and she discovered that she was able to help the younger students. “We as women were able to build each other up,” she explained. Jackson’s passion for education and mentorship led her to the Wake College Center Coordinator position. In addition to supporting students, Jackson was also able to reach out to organizations and establish a number of new partnerships. But, the position has helped her, as well. 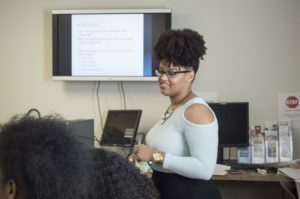 She realized that she wants to be a college counselor and will pursue a Master’s in College Counseling and Student Development at North Carolina State University this year. She also wants to continue in her current position. As Jackson pursues her education and work at the Wake College Center, she’ll continue to support students in any way she can. What Is The Wake Promise?